Selected works by a master of Florentine art, Desiderio da Settignano, will be on display at the National Gallery of Art in Washington, D.C., until October 8, 2007. D esiderio ranks among the most original and influential sculptors, as well as one of the finest stone carvers of the Early Renaissance. Born in 1429 in Settignano, a quarry town just outside Florence, Desiderio and his brothers were trained in the bottega tradition in the Florentine workshop of Bernardo Rossellino. 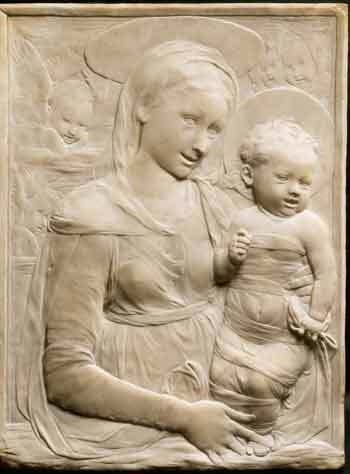 Trained by Bernardo Rosellino and influenced, we are told, by the gentler style of Donatello, Desiderio’s major commission (c. 1459) in Santa Croce was the tomb for Carlo Marsupini, Chancellor of Florence, and shows Rosellino’s influence. This is not included in the exhibit, nor is the Tabernacle of the Sacrament in San Lorenzo, which are in situ. Desiderio, however, developed his own style in his portraits, as evident by the portraits that are part of this exhibit. His mastery and delicacy in chiseling fine features shows individualism and sentimental expression. Although stylistic development is difficult to ascertain by critics, because of the lack of firmly dated works, the beauty, softness of texture and ability of depicting a sitter’s personality through simplicity of form and line, is a constant in all his works. Although a relatively small exhibit--twenty-five sculptures by Desiderio and a few by his closest followers--most of the works in this exhibit are of the highest quality and merit a visit to pay homage to this master. We know that he was successful in his brief career: It was documented in 1453 that Desiderio was admitted to the Arte dei maestri di pietra e legname (stone and wood carvers’guild) in Florence; in 1464, he was buried in the church of San Pier Maggiore and hailed as one of the leading Florentine sculptors of the fifteenth century. Desiderio re-interpreted the genre of portraiture. He not only depicted religious and historical figures, but also did child portraiture, on a small scale mainly on white marble. This genre was not completely new in the history of art, (Romans, and other cultures treated children in their art, but only occasionally, not as a genre of its own). Later in the history of art, Leonardo da Vinci and other artists would portray different ages of man. Pre-figuring realism in his portrayal of children, Desiderio captures their distinctive personalities: from seriousness in demeanor to joviality. In other subjects portrayed by Desiderio, such as the Relief of Julius Caesar (at the Louvre), the dignity and nobility of the Emperor’s pose is captured with directness and clarity. Caesar is depicted in profile, statically pensive, with an almost melancholic expression. In technique however, there is lyricism and spontaneity evidenced by the flowing lines created by the laurel leaves and the curvilinear movement from the head, neck and toga. In religious reliefs, such as the Madonna and Child, Desiderio portrays the Madonna and Child theme in a dignified pose holding the Child Jesus, with maternal tenderness and realism. 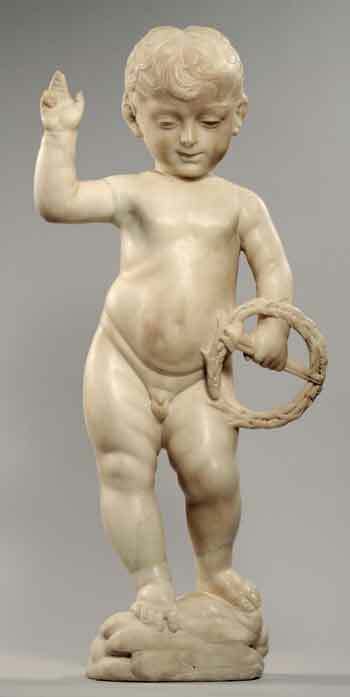 Desiderio uses his signature lyrical, curvilinear sculpting technique and simplification of form. Figures in the foreground are larger, as the background recedes into a distance in a flattened form. These depictions of the Virgin and Child were popular in Florentine households as the numerous stucco replicas of the so-called Turin and Foulc. Desiderio transforms a block of marble into palpable form, capturing a sitter’s mood and personality. He also uses polished and rough textures to create a sense of distance and realism in his relief sculpture, which creates three-dimensionality. In child portraiture, he introduces a new genre with sensitivity in rendering the subject’s expression. Desiderio’s innovativeness is his ability to capture a particular moment in time with directness, delicateness and sensitivity in modeling form in his portraiture and relief sculpture. Angela Puglisi, Ph.D., is a Professorial Lecturer, SCS, at Georgetown University and has also lectured on art history and the fine arts at Catholic University and the Smithsonian Institution.